The sheath dress has become a ubiquitous wardrobe choice for many female TV personalities today. And why not? It’s slimming, stylish and comfortable. However, given the audio equipment that you are often required to wear on camera, I can’t help but wonder how they might be hiding a certain bulge in the back. In a formal studio setting, audio can be captured primarily in one of two ways: a boom microphone or a wireless microphone worn on the body. A boom microphone is made up of a directional microphone mounted on a boom arm or pole. It can be held by someone or placed on a stand just out of frame. Boom mics are very popular for both television and film production because they allow freedom of movement for the subject. A wireless lavaliere microphone is the more common option used for corporate video. It can be clipped onto your clothes and is connected to a battery-powered transmitter that sends the audio signal to the receiver on the camera (or wherever the sound is being recorded). 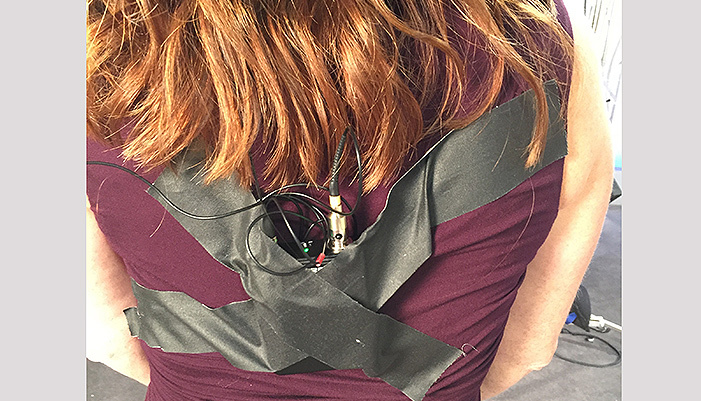 If the video is going to be shot using a boom mic, that gorgeous dress will work just fine, but if you are required to wear a lavaliere microphone, you may have a problem. Not only does the actual microphone need to be clipped on, but the transmitter needs to be clipped on somewhere too. When choosing what to wear, think about where you can clip both the microphone as well as the transmitter pack. If you opt for a dress, you might want to consider belting it, so you can hook the battery pack on it in the back. The safer choice is to wear separates. I often wear a jacket, so I can hide the pack in the back and hook the actual mic on the lapel. I simply attach the battery pack to the waistband of my skirt or pants. Men typically have an easier time accounting for the audio equipment. For more formal business attire, the gold standard for mic placement is the tie. The microphone can be fastened to the necktie with the cables running behind it, allowing it to be centered and at a proper distance away from the speaker’s mouth. For men and women, jacket lapels also provide perfect places on which mics can reside but can be trickier if the speaker is part of a panel discussion and will be looking to both the left and right. The microphone will not be able to pick up the sound as well when the speaker turns away from it. For that reason, the audio engineer will try to center the microphone as much as possible. More casual looks should also be chosen with the mic in mind. Anything with a V-neck or buttons down the front is preferable to a high-necked shirt. A jewel neckline may force the microphone to be placed in an awkward angle under the chin, which might muffle the sound. The fabric of the shirt also plays a role. A silk blouse or a thin sweater may fold under the weight of the microphone, resulting in a rustling sound that may show up right at the end of an otherwise clean take. Opt for a heavier fabric that will maintain its structure when the microphone is clipped on and won’t buckle if you move during the course of your performance.